Over the years, we at Lumon have improved our product development actions so that we now represent the most advanced processes in the sector. We make our high-quality, practical and fashionable products, as well as our useful tools, available for designers to enable the building of better homes for many years to come. Learn more about our elegant frameless balcony and terrace glass systems. The stylish balcony facades and our screens and blinds, designed to work seamlessly with our glass products. The panes are stress and wind tested, extremely lightweight making them easy to slide open and fold. Lumon offers a complete flexible, safe and sustainable solution with fully versatile glass systems that are incomparable to the current industry standard. Take a look at our photo gallery of commercial balcony glazing projects for new construction and renovations, including hotels, restaurants and condominium buildings. Browse through our gallery to gather ideas and inspiration of balcony glass, terrace glass walls and screens & blinds. We’re pleased to offer architects, engineers and developers expert service and support through all stages of your project. Our knowledgeable consultants can provide you with all the technical information and design tools you’ll need. We’ll also work closely with you to manage permits, approvals, design and implementation. Over the decades, Lumon has pioneered in the development of popular, stylish and durable products that today belong to everyday accessories of more than one million people. Our balcony and terrace products are an outcome of our long-term product developments that meet the requirements set by modern architecture. Our production processes are based on our passion for providing terraces and balconies with state-of-the-art glazing solutions, as well as our path-breaking design work, first-rate materials and functional components. Ease of use, durability and fashionable design always come first at Lumon, without forgetting cost-efficiency. As our over 1,000,000 customers can attest, Lumon products are simple and easy to use. Lumon makes its tools and expertise available for designers to help them in their work. The right tools and materials speed up the design process and make it easier to present different options to customers. It is also quicker to make changes according to customised wishes, with the help of the materials library. The Lumon ProdLib library contains everything you need for making good use of our balcony and terrace products in your projects. You can use the ProdLib library as a separate programme, or integrate it directly with your design software. Download and use ProdLib – it is entirely free of charge. After downloading the Lumon design library, you'll receive an automatic message at a later date, every time we have updated our product documents. This is how you always have the latest Lumon design tool version available for you. The design tool library contains extensive instructions for Lumon products. You can design structures so that it is easy and cost-effective to mount Lumon products in place. ArchiCAD is complemented with objects from the Lumon balcony and terrace library. The purpose of the objects is to facilitate your design work and enable you to illustrate and compare the solutions. Download the objects from the design tool library. The Lumon design tool library provides you with the most important tests and approvals of the authorities as summaries in English. The objects in the ProdLib library are well suited for every design software. After downloading the software, you'll find the ready-made construction elements that you can directly insert into your drawings. ProdLib offers a great deal of ready-made materials that facilitate the work of the designer. New details will be updated in the library automatically, and, thus, provide you with the most topical product information. DID YOU KNOW? The ProdLib library provides all the necessary information on the balcony and terrace glazing products. Check out the materials. You may also be interested in our product library installation instructions. Unfortunately, this software is only available for Windows. If you're a Mac user, please email customerservice [at] lumon.com, and we'll arrange to send you the material. It is very popular today to provide balconies with glazing solutions. The glazed balcony produces benefits, not only to the entire property, but also to its every resident. The lifetime of the balcony is more extensive and the balcony serves as a pleasant place to spend your time, all year round. Moreover, an apartment with a glazed balcony is a popular investment object, due to higher rental levels and longer tenancies. Providing the balconies with glazing systems has an impact on their ventilation and energy-efficiency, as well. According to studies, the glass panes of the balcony will bring in energy savings. The glazing is, thus, both an ecological and cost-efficient solution. It is more comfortable for the residents to live in a pleasant audio environment. It is also well known that the glazed balcony decreases noise loads. It is of vital importance to provide such balconies with glass panes that are located close to roads with heavy traffic. 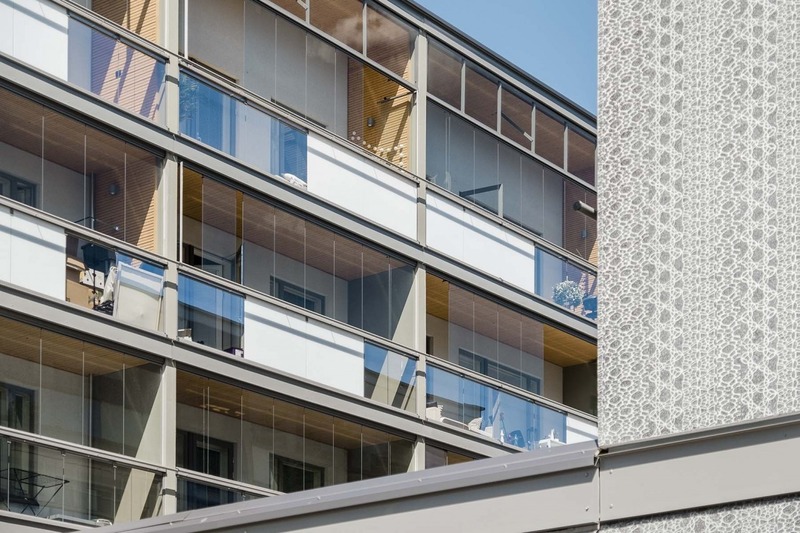 The Lumon balcony and terrace glazing products serve as a modern choice for creating an imposing and up-to-date facade that meets the requirements set by the modern world. Learn more about the balcony glazing benefits and research results. We have used our strong expertise in a wide variety of projects. Here you can see some of the many projects that have been implemented by Lumon.